Published by Ivan M. Granger at 1:35 pm under Books,Poetry Chaikhana Misc. Perhaps a few of the gifts you give this year should wax poetic. Poetry lasts in ways few other gifts can. A really good poem unwraps itself a little more each time it is read, becoming a continuously opening gift to the mind and the heart. Officially, the pre-order period for Gathering Silence was supposed to end today. But I’m not very good at sticking to official rules and regulations. So I am UNofficially extending the pre-order discount through Dec. 8 for orders placed directly through the Poetry Chaikhana. If you have already place a pre-order for Gathering Silence, your order is now being shipped! Standard delivery pre-orders in North America should arrive between Dec. 16 and 19. It’s on its way! The next bit of news: Amazon surprised me by listing Gathering Silence early. 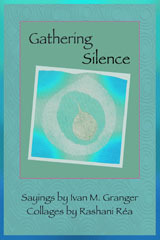 If you prefer to order through Amazon, Gathering Silence is now available through Amazon. This is especially good news for those of you in the UK, Europe, and India who are eager for the book. If you have ordered a copy of Gathering Silence, consider helping by posting your review of the book on Amazon. Good reviews are the best way to encourage new readers to discover this book. Nearly all of the Poetry Chaikhana publications are sold online, and your online reviews are an important part of that. Most of all, I hope Gathering Silence feels like a special gift of color and inspiration and life to you this holiday season. The Poetry Chaikhana’s latest publication! Gathering Silence is a collection of meditative sayings and bits of poetry, accompanied throughout by stunning full-color artwork by internationally-known collage artist, Rashani Réa. 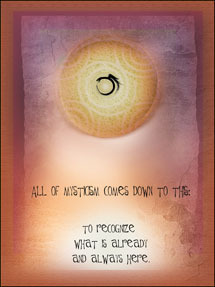 Gathering Silence is a truly beautiful book, filled with color, creative thoughts, and meditative moments. Perfect for an altar or meditation space, by your bed or on a coffee table. A wonderful gift for family, friends, and fellow seekers! I hope you will agree that this book is a work of art! 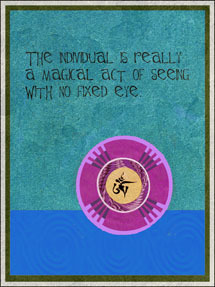 The individual is really a magical act of seeing with no fixed eye. 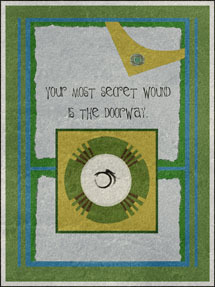 Your most secret wound is the doorway. Outwardly, determined effort is necessary. We have to start our list by highlighting the growing library of Poetry Chaikhana publications! In many ways this is my most personal publication, combining favorite soul-inspiring poems from the world’s great religious and spiritual traditions, accompanied by the thoughts, meditations, commentary, and occasional tangents that have been central to the Poetry Chaikhana poem emails for years. Selections from Rumi, Whitman, Kabir, Machado, Issa, Teresa of Avila, Dickinson, Blake, Yunus Emre, John of the Cross, Lalla, and many others. These are poems of seeking and awakening… and the longing in between. Dorothy Walters explores the spiritual journey through its ecstasies, struggles, and vistas. Each step is observed with the keen insight and clear voice of a modern woman who is both a skilled poet and genuine mystic. Dorothy Walters’s poems are immediate and inviting, transcendent and often playful. Many of these poems are in dialog, with Rumi and Rilke, Denise Levertov and Lalla, each poem contributing its own wisdom and humor to the ongoing conversation that passes between visionaries and sages through history and across cultures. Marrow of Flame has already become a modern classic among spiritual seekers. Original poems by Ivan M. Granger (yours truly) with new translations of works by visionaries from both East and West: John of the Cross, Francis of Assisi, Symeon the New Theologian, Hakim Sanai, Tukaram, Sarmad, Bulleh Shah, Sachal Sarmast, Vladimir Solovyov, Tulsi Sahib, and Antonio Machado. This is a compact anthology, but a wonderful collection that includes Li Po, Wu-Men, Rumi, Kabir, Mirabai, Rilke… And the added bonus of Stephen Mitchell’s way with words. One of my personal favorites. A follow-up to the excellent Illuminated Rumi — excerpts of Rumi’s poetry accompanied by digital collage artwork that draws you deeply into each page. This book entrances on several levels. An excellent gift book. A 20th century Indian Yogi commenting on the spiritual meaning of an 11th century Persian Sufi’s poetry. That combination yields both perfume and controversy — but plenty to contemplate. Lovely artwork and border scrollwork. And Fitzgerald’s delightful translation of this classic. Recommended. This is the first anthology I got years ago that made me say, Wow! Includes Sappho, Rabia, Yeshe Tsogyel, Hildegard von Bingen, Mechthild of Magdeburg, Hadewijch of Antwerp, Lalla, Mirabai, Bibi Hayati, Marina Tsvetaeva. The best collection I’ve found of women’s voices in sacred poetry. Something about Andrew Harvey’s selections and translations always strike a pure note. This book is a delightful collection of poetry and Sufi wisdom stories. Rumi, Kabir, al-Hallaj, Shabistari, Ansari… This is one I return to again and again. Llewellyn Vaughan-Lee has gathered together an excellent collection of short sayings and poetic excerpts from many of the great Sufi masters throughout the centuries. Gathered together in themed chapters, such as The Longing of the Heart, The Path, Mediatation and Prayer, and The Valley of Love. Open this book to any page late at night and find a hidden gem to contemplate. A very nice sampler of Japanese and Chinese Zen poetry. Han Shan, Li Po, Wang Wei, Basho, Soseki, Ryokan, Issa… The book fits well in your hand when you’re walking to the riverside or the local coffee shop. This has quickly become one of my favorite collections of sacred poetry within the many Christian traditions. John of the Cross, Merton, Hildegard von Bingen, Gibran, Dante, Meister Eckhart, Blake… and Roger Housden’s brief, thoughtful insights. This is the book that, years ago, introduced me to the stunning poetry of Symeon the New Theologian, igniting my passion for his visionary poetry of light and transformation. You’ll also find poems and poetic renditions of writings from many other saints and mystics of the Eastern Orthodox Church. Still a favorite of mine. I can’t recommend this collection highly enough. Merton, in addition to being a deep mystic, was a truly excellent contemporary poet. His poems feel entirely modern, yet touch on the eternal. While drawing on Catholic imagery, one can hear whispers of Eastern philosophy and insight in his words. Poems to reread and meditate deeply upon. Poetry by the beloved modern master Thich Nhat Hanh, exploring service and suffering, humanity and interbeing, breath and stillness, beauty and bliss. Bhakti love poems from Radha to Krishna, originally written by a 14-year-old Rabindranath Tagore – as a hoax! That teenage boy became one of the great poets of the early 20th century, and these poems touch the lover’s heart on so many levels. This has become my favorite translation of poems by the great Kashmiri mystic poet, Lal Ded. Sharp insight, flashes of humor, and vast timeless spaces. Despite the book’s title, these are not poems by the historic Sufi poet Hafiz; instead, it is a delightful collection of contemporary poems infused with the spirit of Hafiz. These poems tease and wink, and lead us chuckling to surprising moments of insight. Finally we have a truly excellent collection of sacred Jewish poetry. While T. Carmi’s Penguin Book of Hebrew Verse is more comprehensive, Cole’s The Poetry of Kabbalah has more of a poet’s sense of language and even catches of few sparks from the mystic’s fire. This is poetry that startles and transports. The Poetry of Kabbalah has become my favorite source for Jewish mystical poetry in English. Very highly recommended. A very good collection of the great Hebrew poets and writers who emerged from the flowering of Jewish culture in Medieval Spain. A nice sampling of important figures of Kabbalah, philosophy, and culture, like Hanagid, ibn Gabirol, Halevi, Abulafia, and many more. You can’t go wrong with anything by Mary Oliver, but if you’re looking for a good introduction to her poetry, Why I Wake Early is a nice place to start. This collection is one to enjoy, one poem at a time, in those quiet moments before the busyness of the day starts. Not a book of poetry, but a book that belongs on every poetry lover’s bookshelf. This is a book about the transformational nature of poetry – reading it, speaking it, writing it. Poetry as therapy. Poetry as a pathway to self-exploration. Poetry to rediscover your true voice. I was surprised how much I liked this book. What can I say? Read the first few pages and you won’t want to stop. An exploration of the power of poetry to open our lives in surprising, healing ways and, at the same time, an engaging personal memoir. Highly recommended. I keep being told by people how much they love this book of poetic blessings from the Irish philosopher, poet, and mystic, John O’Donohue. These poetically crafted blessings and meditations on the passages of life manage to elevate the spirit, warm the heart, and, on occasion, bring a tear to the eye. For even more excellent book recommendations, click here. Lets remember that, in the midst of winter’s dark, this is the time to renew the light — within ourselves and our world. Regardless of religion, may we recognize our shared brotherhood and sisterhood within the human family, all within the lap of the generous green earth that is our home. — and that the new year brings you bright blessings!